Imagine the scene…(and if you can’t, then look at the pictures accompanying this article). Imagine an emerald green subtropical garden bursting with vegetation, grass-covered open-air pavilions, the sound of running water and exotic bird cries, the smell of mangoes and adobo cooking in the kitchen… An oasis in an oasis: this is the Rogationist Center in Silang, the Philippines, about an hour’s drive (three times that in heavy traffic) due south of Manila. 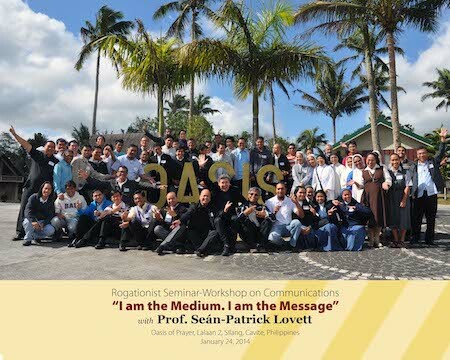 The Oasis is where CREC held a one-day intensive communications workshop on January 24th entitled: “I am the Medium. I am the Message”. The open-air session was attended by over 60 people (men and women religious) who came to discover how they can effectively be both. Coordinated by a former student of mine from the Pontifical Gregorian University, Fr Rene Ramirez, RCJ (class of 2005), and hosted by the Rogationist Provincial, Fr Herman Abcede, RCJ, we began at dawn with a prayer – and ended at dusk with a pizza (mouth-wateringly prepared, using exclusively Italian ingredients, by Fr Rene himself). The day provided food for the mind, spirit and body (in every sense), true to the holistic vision of CREC and turned out to be more of a celebration among friends than a session among students. PS: And don’t forget to watch the video – produced by another former Gregorian University student of mine, Fr Rito Ibanez, RCJ (class of 1997). And if you haven’t yet looked at the pictures, then now would be a good time: they were taken by Fr Ferico Duque, RCJ and Sr Gemma Victorino PDDM (yes, they were my students too). At CREC we like to keep it in the Family…Italian-style.